Well the supermoon didn't pull up more water than we could handle and scatter the fish, so that's good news. It's been a few wind laden weeks since my last post so I'll try to summarize what's been happening down here on the Cape Fear Coast and Wrightsville Beach inshore waters. 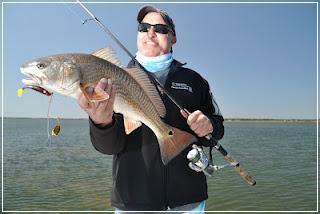 The first real series of tailing tides has passed and with them some fun and exciting sight fishing opportunities. The relentless wind has made for tough conditions for some of my fly anglers while providing some valuable experience with learning how to cast in 10-15kt winds. Surprisingly the water hasn't been too terribly soiled by this past April's windy intentions. 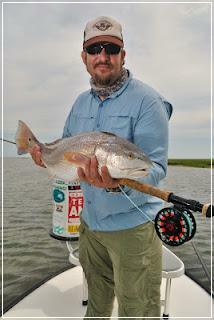 We've had some good tailing redfish action and some exceptional low tide fishing for redfish. Most of the fish are beginning to break out of their winter patterns of schooling up in large numbers though there are some schools still around. I had the pleasure of Larry Rushin out on the water recently to chase some early April reds and we had a time cutting up and exploring some new territory. Larry made several more casts than he should have had to before landing this beautiful redfish on a redfish magic spinnerbait. A few days later Glenn Wilson joined me for some sight fishing on the fly in the wind...we managed to find some large redfish and Glenn connected with a fat ten pounder to finish the day before we literally got blown off of the water. The highlight for Glenn was the eat was fifteen feet from the boat, very visual and the fish inhaled a fly that he had tied on his own. The fishing here at Wrightsville Beach NC is just now starting to fire off. 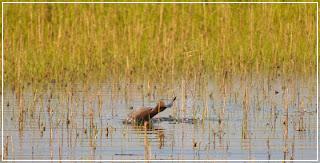 Don't miss the opportunity to have your own adventure this season! Call or email to book your trip today!